Rhodocrosite was first discovered in 1813 in Romania. It derives its name from the Greek words “rhodon,” meaning rose, and “chros,” meaning color. Primarily, rhodocrosite is used in the manufacture of stainless steel and aluminum. 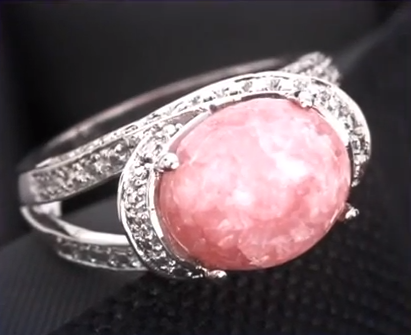 Good quality specimens are used in the creation of jewelry. – Registers as a 3.5-4 hardness on the Mohs Scale. – Ancient Inca believed it to be the blood of their former rulers turned to stone. – Colorado adopted rhodocrosite as their state mineral in 2002. – The Alma King is the largest known specimen, discovered in Alma, Colorado. In its purest form, rhodocrosite appears a translucent rose color, though it can also be found in pink, cherry-red, yellow and cinnamon-brown variations. The most common color is pink, however. Banding is frequently found in jewelry quality specimens. We’ll be featuring this fantastic stone for 8 hours on Saturday, June 22nd, so be sure to tune in so you can see this beautiful stone for yourself! 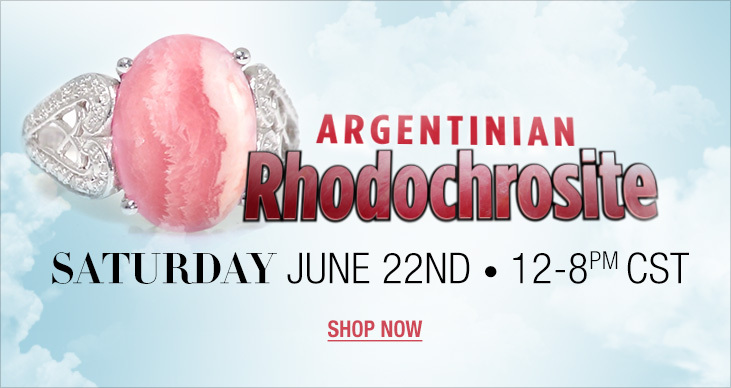 In the meantime, feel free to check out the preview or our Rhodocrosite show below, or click here to browse our Rhodocrosite Gallery on Pinterest.